Mix all the ingredients together in a large bowl and serve as a salad or side with a portion of grilled meat or fish. Add the oil to the pan and sauté the onions on medium heat for a few minutes, and then add the ginger and quinoa. Cook for one minute stirring constantly. Now add the spices and season with salt stirring it well. Add the water and bring to the boil, then cover and reduce heat, allowing to simmer for 10-12 minutes or until the water has been absorbed. 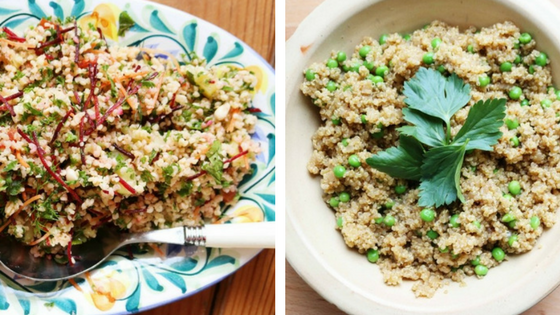 Fluff the quinoa with a fork and serve as a side. There you have it. Two quick and easy recipes that are full of flavour. Treat yourself to a real kick of flavour in next week’s meals and make sure you actually look forward to tucking into each and every meal. I’d love to see your own creations after you’ve given the recipes a try. Tag me in your photos on Facebook and Instagram. The best photo will get a 10% discount of a personalised training programme and one day meal plan.